A candle lighting ceremony is a physical representation of the unity between the couple as they enter into a lifetime of marriage together. 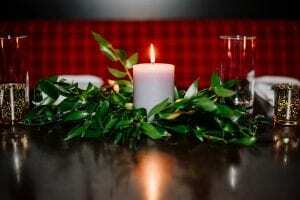 It is a ceremony ritual of lighting one candle together, with two different flames. The candle lighting is typically done directly after the vows are shared. There are several different alternatives as to how you light the candles. Some lightings are done by the parents and the couple but it can also be done by only the bride and groom. 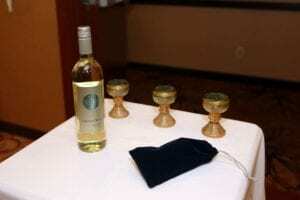 A wine mixing ceremony is symbolic of the mixing of two separate individuals, or families, into one. The ceremony can be done in several different ways, depending on the meaning you would like for it to have. It is typically done after the welcome to the wedding. One option is to have the parents of the bride and groom help with the ceremony to represent the two families and their history coming together into one family, connected from this day forward. Another option is to have the the bride and groom each pour different wine into one glass and then drink from the same glass. This is a representation of their separate lives coming together to make one new life together. If your wedding is outside, in a garden, a park, or your own backyard, a tree planting ceremony is a great addition to the day! It is also a way to have a piece of your wedding day for many years to come. If you are needing a more portable way to do your tree planting ceremony, you can plant a pomegranate tree or an apple tree into a small pot and transport it into your first garden together. Mothers or grandmothers could bring a jar of soil to add to the planting as well. The tree planting is symbolic of the roots you are planting and the love that will grow for years to come! 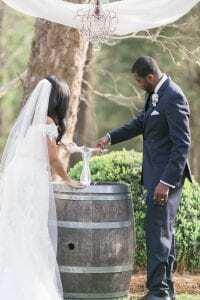 The sand mixing ceremony is another way to represent the unity between the bride and groom and a great way to incorporate family or children into the ceremony. There are three jars, two filled with sand and the third is empty. For the mixing, both of the jars of sand will be poured and mixed into the third jar. This ceremony is symbolic of the mixing and uniting of two things that were once separate. Just as the sand can never be separated back into the containers, so will the marriage be! Whatever ceremony tradition you decide be sure to talk with your fiance. Figure out what message you would like to send at your ceremony and how you would like to show the unity between you. 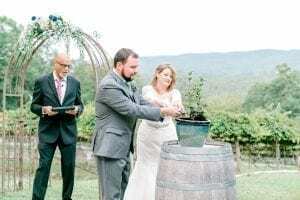 Once you decide on a tradition, ask your officiant about the wording and execution of the ceremony. But most importantly have fun with it! This is your chance to show off the love you have and the union you are creating. Want more great tips on all things wedding? Contact Magnificent Moments Weddings today! We would love to help make your wedding dreams come true!